The days are getting shorter and the temperature is dropping. Winter's approach means that many horse owners are digging out their horses' blankets – but are blankets a necessity? Depending on your situation, your horse may well be able to go without a blanket, but it's a decision that you have to make during the fall to properly prepare your horse. If you plan to ride throughout the winter, then you're probably planning on clipping your horse's coat to help him cool off faster after workouts. If you'll be clipping your horse, then you will have to blanket him as well, to make up for his lack of a winter coat. But if you plan to ride only occasionally or lightly and will be letting your horse grow out his full winter coat, you might not have to blanket. Whether or not you choose to blanket greatly depends on your individual horse and climate. If your horse grows a thick, full winter coat, he may be fine without a blanket. 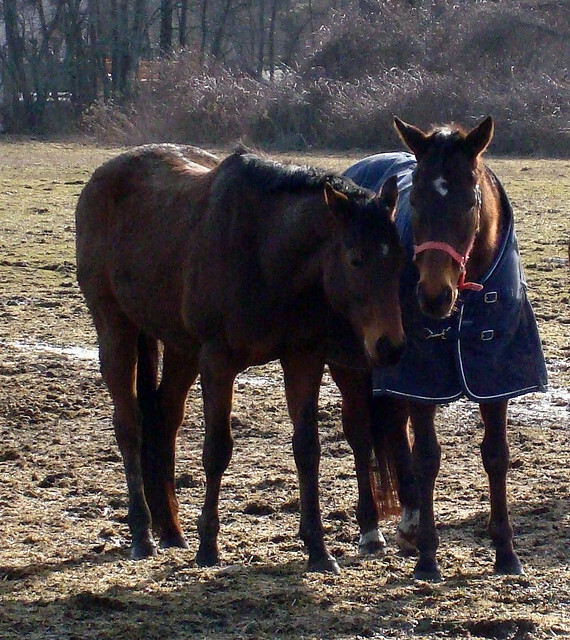 Some breeds, such as the Thoroughbred and Arabian, tend not to grow such thick coats; even if you let them grow out, you may need to supplement with a blanket during the harsher winter weather. Even within these breeds there are variations, though, so make the choice based on your own horse's needs. The guidelines on equisupermarket.co.uk about this seem to suggest that older horses may also benefit from blanketing, as can those who are prone to colic – it is thought that gas colic may be aggravated when a horse is not kept warm. If your horse spends time in a stable, then he will be more sensitive to the fluctuations in temperature than would a horse who lives outside all year round. If your horse is stalled at night, he will not be able to move around and warm himself, and he won't have the body warmth provided by a herd of horses. If your barn is closed up tightly at night, though, and temperatures don't drop dramatically, you also need to take that into consideration when deciding whether or not to blanket. If you opt not to blanket your horse, then you need to stick to your decision from the very beginning. If you put a sheet on your horse during the fall as the temperatures become cooler, then you must continue to blanket him with heavier blankets as the winter comes in: he will not grow enough of a coat to protect him against the elements if he's blanketed earlier on in the season. If your horse is not blanketed, you must provide him with a shelter. A large shed in a field can be enough, but be sure to check on your horse daily to make sure that he is not shivering. Also, whether or not your horse is blanketed, provide him with increased forage during the winter, as his caloric intake will increase as he uses the calories to keep himself warm. Should you decide to blanket, then have a variety of blankets of different weights on hand to keep your horse comfortable as the temperature fluctuates. If you don't blanket, then keep an eye on your horse to make sure that he can withstand the winter temperatures comfortably. This entry was posted in Horse Health. Bookmark the permalink.